Trying to operate and maintain a full blown culture system from an eight hour drive is a daunting task, but every year at about this time Genoa National Fish Hatchery (NFH) begins packing the 8 foot by 24 foot work trailer that will be home to upwards of 1,500 young lake sturgeon for the summer. If all goes well, and the egg collection efforts are successful, around 3,000 eggs from Michigan’s Allegan Dam spawning site on the Kalamazoo River will be disinfected and enter the trailer unit. In preparation for this, every year we have a training program. Originally the training was for our streamside trailer staff, but it has recently become training for other conservation partners that are beginning their own streamside rearing trailer efforts. This year staff from the Toledo Zoo and our Alpena Fish and Wildlife Conservation Office (FWCO) in Michigan came out to learn more on lake sturgeon egg and larval fry care. The next day staff joined us from the Ashland FWCO in Wisconsin to learn about trailer systems operation, which involves heating and cooling culture water, filtering river water of impurities and ultraviolet disinfection of the incoming water supply. This ensures a healthy trailer sturgeon population that imprints on their natal or birth river water supply. When the fish are old enough to reproduce, they will come back to their birth river to increase their river specific population. This should ensure that they are the most suitable fish for the Kalamazoo River, and able to adapt and thrive to their home waters. Due to wet conditions on the site, the trailer is waiting on the Michigan Department of Natural Resource’s maintenance site near the river, and will just have to wait for the day when it will be full of baby sturgeon later this spring. Many thanks to our tribal partners, the Gun Lake Tribe, for helping us set up the trailer and leading egg collection efforts. 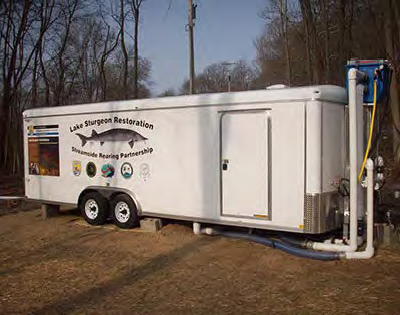 In April, we hope for the trailer’s full deployment at the trailer site, thereby fulfilling its role in Lake Michigan’s lake sturgeon restoration efforts.